For other uses, see Star of the Sea (disambiguation). Our Lady, Star of the Sea is an ancient title for the Virgin Mary. The words Star of the Sea are a translation of the Latin title Stella Maris. The title has been in use since at least the early medieval period. Originally arising from a scribal error in a supposed etymology of the name Mary, it came to be seen as allegorical of Mary's role as "guiding star" on the way to Christ. Under this name, the Virgin Mary is believed to intercede as a guide and protector of seafarers in particular, the Apostleship of the Sea, and many coastal churches are named Stella Maris or Star of the Sea. The miraculous statue of Our Lady, Star of the Sea in Basilica of Our Lady (Maastricht), the most important Marian shrine of the Netherlands. The name stella maris is first applied to the Virgin Mary in the manuscript tradition of Saint Jerome's Latin translation of the Onomasticon by Eusebius of Caesarea. although this is in fact a misnomer based on a transcription error. For reaching this meaning the Hebrew name Miryam (מרים) had to go through a series of transformations: in Judeo-Aramaic it became Maryām, rendered in Greek as Mariam (Μαριάμ). It was this form that was etymologized by Eusebius. He interpreted Maryām as mar-yam (מר-ים) "drop of the sea", based on מר mar, a rare biblical word for "drop" and ים yam "sea". St Jerome adopted this interpretation and translated the name into Latin as stilla maris, "drop of the sea", but at some later stage a copyist transcribed this into stella maris, "star of the sea", and this transcription error became widespread. Another opinion[clarification needed] states that Jerome himself interpreted the name as meaning "star of the sea" or Stella Maris, by relating it to a Hebrew word for star, מאור (ma'or), from the verb אור ('or), to be light or shine. The etymologization of the name of Mary as "star of the sea" was widespread by the early medieval period. It is referenced in Isidore's Etymologiae (7th century). The plainsong hymn "Ave Maris Stella" ("Hail, Star of the Sea") dates from ca the 8th century. Paschasius Radbertus in the 9th century has an allegorical explanation of the name, writing that Mary is the "Star of the Sea" to be followed on the way to Christ, "lest we capsize amid the storm-tossed waves of the sea." In the medieval period, stella maris came to be used as a name of Polaris in its role as lodestar (guiding star, north star); it may have been used as such since Late Antiquity, as it is referred to as ἀειφανής "always visible" by Stobaeus in the 5th century, even though it was still some eight degrees removed from the celestial pole at that time. In the twelfth century, Saint Bernard of Clairvaux wrote: "If the winds of temptation arise; If you are driven upon the rocks of tribulation look to the star, call on Mary; If you are tossed upon the waves of pride, of ambition, of envy, of rivalry, look to the star, call on Mary. Should anger, or avarice, or fleshly desire violently assail the frail vessel of your soul, look at the star, call upon Mary." Anthony of Padua also wrote of Mary as Star of the Sea. Pope Pius XII in his encyclical, Doctor Mellifluus, also quoted Bernard of Clairvaux in saying; Mary ... is interpreted to mean 'Star of the Sea.' This admirably befits the Virgin Mother.. (for) as the ray does not diminish the brightness of the star, so neither did the Child born of her tarnish the beauty of Mary's virginity. Stella maris was occasionally also used in reference to Christ. Robert Bellarmine (writing c. 1600) deprecated this use of the title, preferring the allegory of Christ as the morning star as the "brightest star of all", classing the less-bright polar star as "paltry" (exigua)..
A closely related expression offline "morning star" is referenced in Revelation 2:28 and also in Revelation 22:16. Jesus Christ God claims Himself as being the "morning star", that is also the gift he had from God the Father to be routed to any winner in the faith and perseverant in the works according to His Law. Prophecy narrowd Jesus hasseven stars at the right of His throne, arguing they are identified the seven Angels of the Seven churches of Asia. In the mystical visions of John, the Woman in front of the Dragon takes twelve stars over her crown. The idea of Mary as a guiding star for seafarers has led to devotion to Our Lady, Star of the Sea in many Catholic coastal and fishing communities. Numerous churches, schools and colleges are dedicated to Stella Maris, Our Lady Star of the Sea, or Mary, Star of the Sea. Stella Maris Monastery, the foundation house of the Carmelite order was established on Mount Carmel, Israel, in the early thirteenth century. The abbey was destroyed several times, but a refounded Stella Maris monastery is still considered the headquarters of the order. Devotions to this title of Mary are found in the popular Catholic hymn, Hail Queen of Heaven, the Ocean Star and the ancient prayer Ave Maris Stella. The widely sung "Sicilian Mariners Hymn", O Sanctissima, also reflects this devotion. Our Lady, Star of the Sea is the patroness of the Netherlands. The Roman Catholic Church honors Our Lady, Star of the Sea, with a feast day assigned to September 27. The Apostleship of the Sea (AOS) is often known locally as Stella Maris, whom seafarers recognise for providing pastoral, practical and spiritual support via their port chaplains and ship visitors in ports around the world. 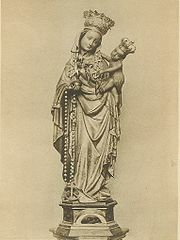 Our Lady Star of the Sea is the patron of the AOS. The Apostleship of the Sea has for many years now, been commemorating the Feast of Stella Maris, Our Lady, Star of the Sea, with Mass each year in September for seafarers. It is a day to pray for all seafarers and give thanks for their contribution to global trade. The dates, times and venues of Stella Maris Masses for 2018 in England and Scotland can be found here. At a gathering during the Stella Maris Mass in Westminster Cathedral in 2016, Archbishop of Westminster Cardinal Vincent Nichols said, "Caring for seafarers is profoundly Christian thing to do". A nineteenth-century painting of Mary, Star of the Sea. The star on Mary's robe alludes to her epithet of Stella Maris, the Star of the Sea. The Walters Art Museum. Stella Maris Lighthouse on the Uruguay River near the town of Concepción del Uruguay in Argentina. Stained glass window by Jo Tinney, Alpha Stained Glass Studio Derry, depicting Our Lady, Star of the Sea with the Donegal Bay as seen from Bundoran in the background. 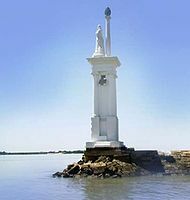 Wikimedia Commons has media related to Our Lady, Star of the Sea. ^ Richard Hinckley Allen, Star Names and Their Meanings (1899), p. 454. ^ a b Arie Uittenbogaard. "Etymology and meaning of the name Miriam". Abarim Publications. Retrieved 20 October 2015. ^ Maas, Anthony (1912). "The Name of Mary". The Catholic Encyclopedia. Robert Appleton Company. Retrieved 21 December 2012. ^ 1611 King James Bible: Apocalypse or John, chapter 2, verse 28. kingjamesbibleonline.org. Archived from the original on May 8, 2012. ^ Reed, Isaac, ed. (November 1792). "The Sicilian Mariner's Hymn to the Virgin". European Magazine and London Review. 22 (5): 385–386. Retrieved 18 October 2016. ^ Herder, Johann Gottfried (1807). "An die Jungfrau Maria: Ein sizilianisches Schifferlied". Stimmen der Völker in Liedern. pp. 175–176. Retrieved 18 October 2016. This page was last edited on 1 March 2019, at 20:03 (UTC).